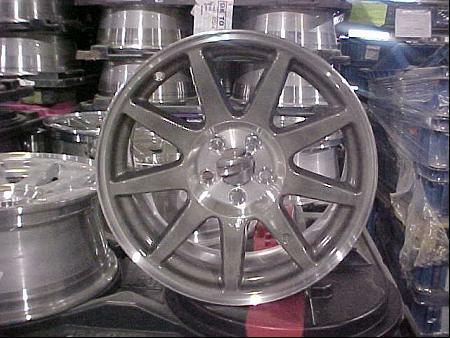 Aluminum Wheel Stripping Products that Restore Original Surface Quality to Recondition Aluminum Wheels. 6 - Q. Can MILES New Low-Temperature Chemical Paint Stripping Products be used to Paint Strip Powder Coatings and E-coat from aluminum zinc steel and multi-metal substrates? A. Yes, MILES New Low-Temperature chemical paint stripping products can be used to paint strip powder coating and Remove E-coating paint from aluminum magnesium brass steel & non-ferrous substrates in addition to removing urethane from TPO & other plastic substrates. Q. What are the advantages of stripping my paint rework parts in-house? Q. What are the advantages of MILES new proprietary paint strip chemistries, when compared to other stripping technologies available? Q. Will MILES proprietary paint strip process strip liquid applied, (cured) paint as well as stripping powder coat paints? Q. What is the strip time for most production painted parts? 1 - Q. What are the advantages of stripping my paint rework parts in-house? A. #1. The most important advantage of stripping your paint rework parts in-house is the opportunity to maintain quality under your roof, without damage that can occur in handling during transportation to and from the paint strip service location. #2. Reduced turn-around time, in most cases reduced from 3 to 5 days, to 1 to 2 hours stripping in-house. #3. Cost Savings in-house, when compared to added service and transportation costs. 2 - Q. What are the advantages of MILES new proprietary paint strip chemistries, when compared to other stripping technologies available? A. The advantages of MILES new proprietary paint strip technologies are all so significant that it's hard to place them in any particular order of importance. (a) MILES proprietary formulas are environmentally more friendly than hazardous regulated chemical technologies. MILES proprietary paint strip processes are more operator friendly. (b) MILES new proprietary technologies leave the substrate surface in like-new condition with original surface quality. 3 - Q. Will MILES proprietary paint strip process strip liquid applied, (cured) paint as well as stripping powder coating paints? 4 - Q. What is the strip time for most production paint rework parts? A. The strip time in most cases is directly related to the paint film build on the parts. Most OEM production painted parts have a dry paint film build of from 1 mil up to 10 mils. MILES proprietary paint strip process can remove paints up to 10 mils of paint in 30 minutes to a maximum of 1 hour for stripping automotive coatings that incorporate e-coat, base coat and clear coat coatings. Place your company at the Top of your States Category Today!